60-Day notices are a way of informing a person regarding certain changes or reminders that are happening after 60 days. In most cases, it involves a landlord informing a tenant that they have to evacuate out of their rented space due to certain reasons. Whatever your reason may be, we have a few notice forms that would be useful for anybody that needs to give a specific person a written notice. 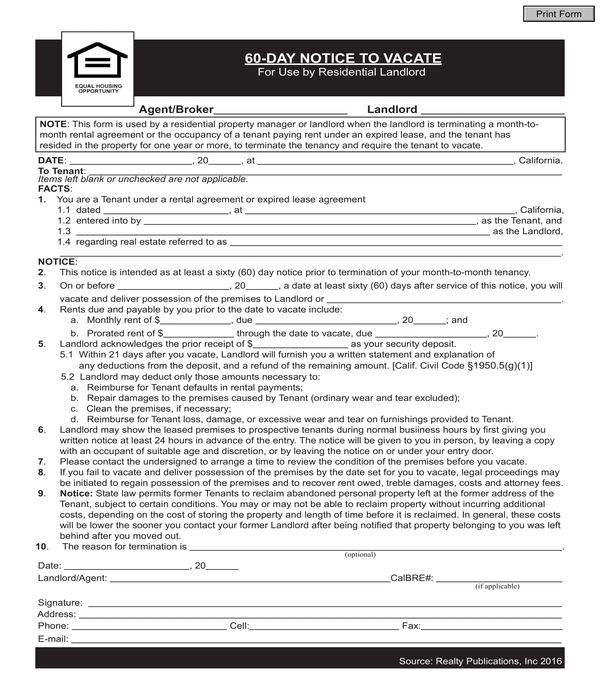 A 60-Day Notice to Vacate type of notice is sent by a landlord to a tenant who has been renting for a year or more, and the landlord wants the tenant to move out or find another place to rent. This is often given when a landlord does not want to renew the lease of the tenant for one or more reasons. The difference between a 60-day notice and a 30-day notice is that 30-day notices are given if the tenant has rented for less than a year while a 60-day notice is given to those tenants who have rented the landlord’s space for a year or more. Overdue Rent Payments: Probably the most common reason for eviction and lease termination is the nonpayment of rent. In a legal dispute, most judges and courts make little exceptions to permit non-paying tenants to continue staying in the rented unit. Having said that, should landlord fail to supply a habitat that is not livable or inhabitable, then nonpayment of rent can be overlooked. 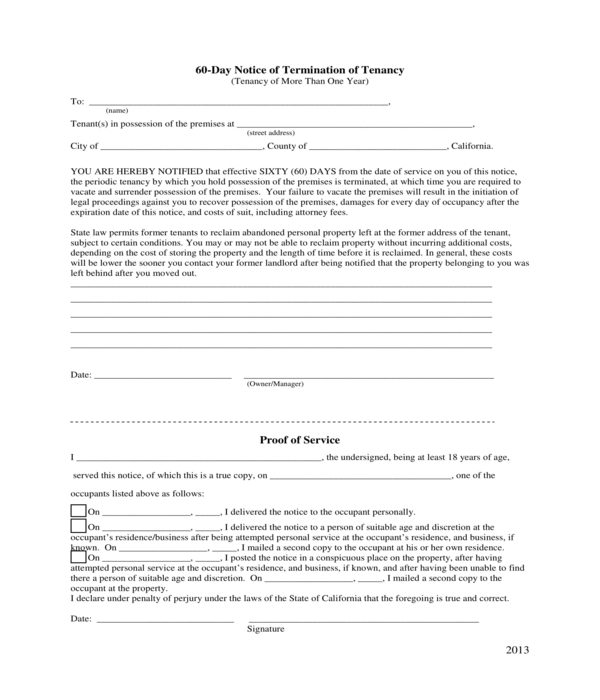 Also, see rental agreement forms. Violation of Lease: There are many violations in which the landlord can terminate the lease. Tenants are often given a few days to correct it before an eviction. Some of the most common lease violation includes having unauthorized pets, unapproved occupants or extended guests, unapproved subletting, nuisance complains or misuse of the unit. Damage to Property: This talks about major damages that happen when a tenant is in a rental agreement with a landlord. Drug-Related or Illegal Activity: A landlord does not even need to give the tenant a 30 or 60-day notice once illegal activities have been discovered and can terminate their least within 24 hours. 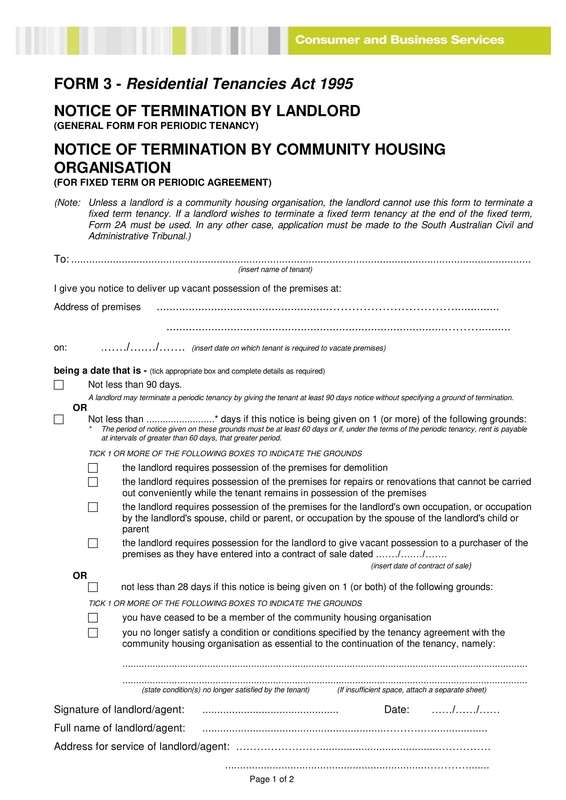 The Lease has Expired: Whether the lease has naturally expired or is terminated with proper notice, the tenant has to move out and loses his right to occupy the unit. A 60 Day Notice to Change Terms is handed over by a landlord to the tenant informing them that after 60 days of receiving the notice, there will be a few changes regarding the rental agreement. Oftentimes, it is to make the tenant knowledgeable that there is an increase in rent prices after 60 days. Also, see rental increase form. In some occasions, a tenant and landlord can agree together to end the tenancy agreement on a certain date. There are mutual agreements for a tenant to end a tenancy. Should tenant leave without given proper notice or paying full rent, the landlord can file for a dispute resolution to get the unpaid or lost rent plus the reimbursement costs associated with re-renting the unit. See also, dispute resolution form. 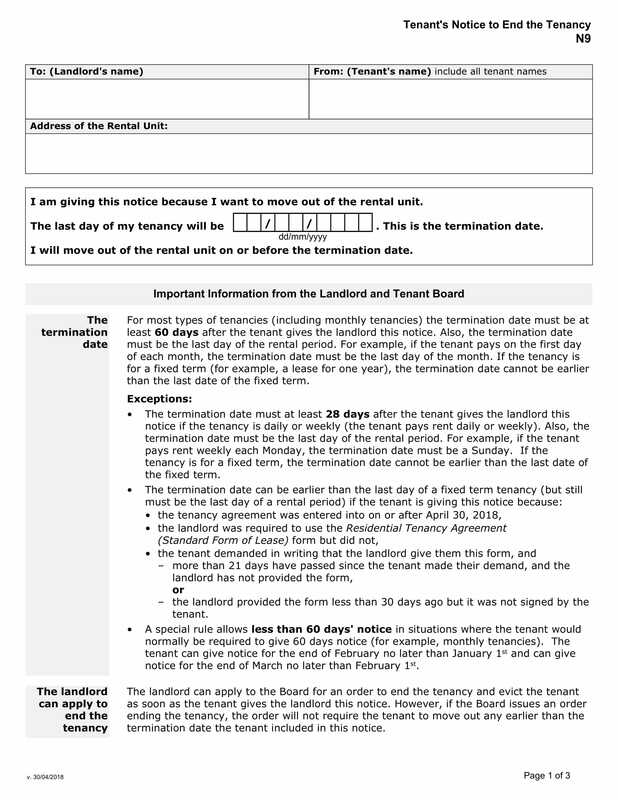 Personally delivering a tenant a copy of a notice: Landlord must keep a three-part, self-carbon forms, and the landlord must always keep the original, which is the white copy. Because a tenant can easily deny that the landlord has failed to provide a notice, this can delay an eviction. Always get the signature of the tenant on the white copy, and date of when it was served. If there are more than one tenants, they must have their own separate notice and should each be signed accordingly. You may also snap a photo of the signing on your cell phone for further proof of the service. Serving the notice to another person at the rental unit: Should the tenant always seem to be out of their home and it is difficult and challenging to catch them while they are around, you may give the notice to another person as long as the other person is of suitable age and discretion is present. 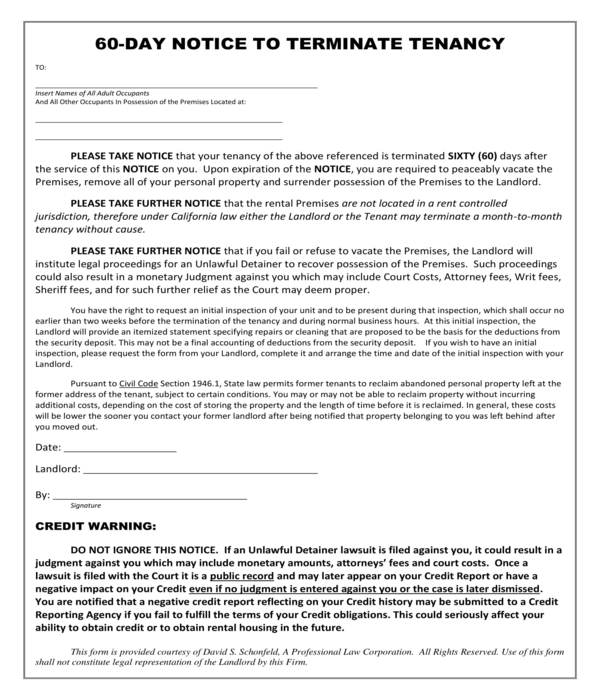 Get their signature and/or take their photo of the signing and you must mail a copy of the notice to the tenant. It could be their teenage child who is mature and dependable enough to pass along the notice/s to their guardian, a babysitter, or another person that is not on the lease. Mailing: All that is required is first-class mail since registered or certified mail is not usually signed by tenants anyway. When a delay happens, this means that there is a possibility of an additional month before a landlord can serve the notice again, which makes mailing favorable if hand delivering the notice is difficult. Having a refused service is a favorite tactic of tenants that can get a month or more of free rent in a few cases. “Proof of Mailing” or “Certificate of Mailing” is the best way to mail a notice, which provides proof that landlord has mailed documents to a certain entity. When leaving the post office, you have a receipt that indicates the name, address, and date you mailed the envelope. The signature of the recipient is not a requirement as a Proof of Mailing gets the notice delivered with an authorized certificate in hand minus the need for the tenant to sign it. Do not open if the envelope is returned by the postal services as this erases the proof that what was inside the envelope was mailed on that date. Utilization of a professional process server to deliver the notice: A professional process server can hand deliver your notice to a tenant for a price. It often emphasizes that this is a serious legal matter and that other people are involved. A powerful looking process server can make it a very clear statement. This helps as many tenants often think that landlords have little power and can be easily intimidated or bullied. Posting: This can be done by taping it to the front of the door of a residence. Do not place it in an envelope and slide it under the door as an excuse for not receiving the notice can be said. Having the notice taped to the door allows for the tenant to see it and knows what it is. Always take two pictures of the posting as the possibility of accusations that a notice was not posted at all is probable. The first picture must be of the notice itself with its details that is clear and readable. The second photo should be of the unit’s door which indicates that the house/unit number is clearly identifiable with the notice posted clearly on the door. Many landlords are concerned regarding exposing personal information to anyone who passes by the door and is not comfortable using the posting notice, then the best method for you is via mailing or personal service. Handing over a 60-day notice to a tenant can be quite stressful for landlords. Although you want to keep the integrity of your business and try to be empathetic towards those who are unable to pay for their dues, it makes you as a business person easy to manipulate in the eyes of other tenants, which is bad for business. There is a difference between knowing if you are being taken advantage of a tenant and a tenant having a difficult time making ends meet. A landlord can only understand so much as they too need to take care of themselves. 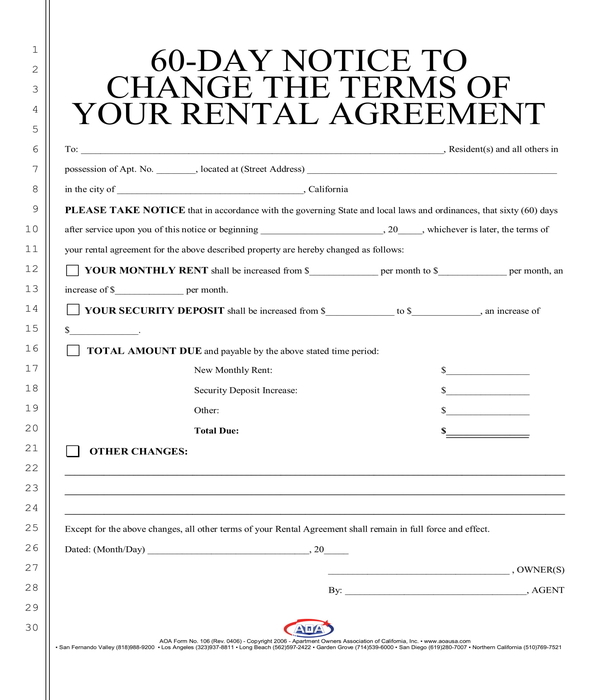 With the aforementioned information presented here, we hope that you have more of an understanding regarding what a 60-day notice is and how to serve these notices.